One of the interesting aspects of being in applications is the wide variety of interesting samples that you come across and this one came up when I was looking for a sample for an upcoming webinar, where I needed some ‘pretty’ maps. Our US EBSD applications engineer Shawn Wallace was previously at The Department of Earth and Planetary Sciences at the American Museum of Natural History in New York and consequently he knows quite a bit about space rocks. He handed me a thin section of a meteorite labeled NWA 10296 (more information at https://www.lpi.usra.edu/meteor/metbull.php?code=62421) and it did not disappoint. There were a lot of interesting features in the sample, but I ended up concentrating on one of the large chondrules shown below. The primary composition of the sample is olivine (magnesium iron silicate) and the maps below show a high concentration of the Mg internal to the chondrule with an outer perimeter low in Mg and Si. 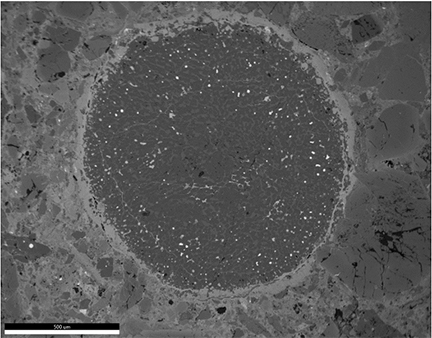 The iron within the chondrule is forming particulates with low content of O and some veins of Al is also seen while the outer perimeter is an iron oxide. Figure 2. Mg, Si and O maps (left to right). My astronomy classes are long behind me and I can’t claim to be able to extract deep insight as to the formation and origin of this meteor but regardless, there’s something fascinating about looking at some of the early matter of the universe. As I heard Emma Bullock phrase it at the Lehigh Microscopy School, “It might just be an old rock, but it’s an old rock from outer space!”. Figure 3. Fe (left) and Al (right) maps.